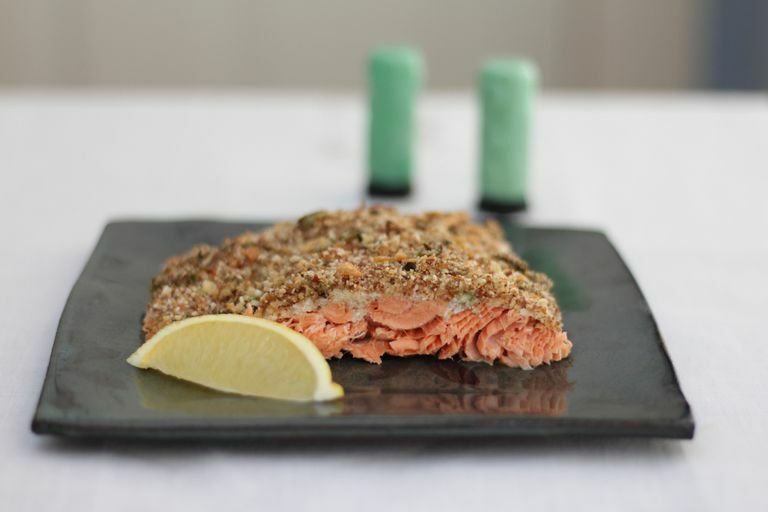 This recipe combines the crunch of nuts and flaxseed with the texture of tender salmon for a main dish with lots of anti-inflammatory omega-3 fatty acids. The bulbs of the scallions are a source of FODMAPs, so using only the scallion greens in this recipe keeps it IBS-friendly. Preheat the oven to 425F. Line a baking sheet (with sides) with foil. In a blender or food processor, process almonds and flaxseeds until a uniform, sandy texture is achieved. Transfer to a small bowl and stir in the bread crumbs, salt, thyme, pepper, scallions and lemon zest. Place fish skin-side down on the baking dish. Brush fish with garlic-infused oil and lightly sprinkle with salt and pepper if desired. Spread the crumbs evenly over the fish, pressing to adhere. Bake fish until it flakes easily and crumbs are golden brown, 18 to 25 minutes. For an extra crispy topping, coat crumbs with baking spray or a mist of oil. Hold oil spray 10 inches above the crumbs. Spray evenly with a sweeping motion until crumbs look wet, then bake. To make this recipe gluten-free, use gluten-free bread crumbs. Cut bread into 1/2-inch pieces. Bake in a single layer until medium golden brown and dry, 15 to 20 minutes, turning once during baking. Pulse bread in a food processor or blender until crumbs are the desired texture. If the crumbs are still soft, return them to the oven and bake until completely dry, 5 to 10 minutes. No food processor or blender? Add the cooled, toasted bread to a zip-top bag and close, leaving a tiny opening. Crush with a rolling pin or pan bottom. Toasting nuts enhances their sweet, nutty taste. If you aren't able to purchase pre-toasted nuts, you can make them yourself. Oven-toast nuts at 350F in a single layer until light golden brown, 10 to 12 minutes for whole nuts. Stir halfway through toasting. Nuts continue to brown even after removing from the oven and can burn quickly, so watch them closely. To grind nuts in a blender, get the blades turning in the empty blender and drop nuts in through the top center of the lid a few at a time. Citrus zest (lemon, lime, or orange) packs a flavor punch in low-FODMAP recipes. A modern, steel, fine rasp grater is a low-FODMAP kitchen essential. The sharp teeth zest a whole fruit quickly and make it possible to avoid the white pith. The grater can also be used for hard cheese or chocolate and makes a little go a long way.